Does Nauru Owe Australia Anything? Most angles of the debate over offshore detention on Nauru are covered exhaustively by the Australian media. Indeed, much of the debate over offshore detention mimics a live autopsy of Australian identity. Is this really something “we” do? If so, who are “we”? This navel gazing — over “push” and “pull” factors, Australia’s failure to comply with its obligations under international law, and the role of politicians — has prevented a key aspect of the issue of offshore detention from being properly ventilated: the ease with which Australia has slipped back into treating Nauru as a satellite colony. Australia’s administrative role in the environmental destruction of Nauru is all too frequently glossed over in debate. Yet the readiness with which this former “trusteeship” has been repurposed for use in refugee policy brings to mind key elements of an exploitative relationship for which Australia has still not fully atoned. From 1919 to 1968, Australia administered Nauru pursuant to the Nauru Island Agreement, a post-war compromise which divided between Britain, Australia and New Zealand the profits of phosphate mining of Nauru without any consultation with Nauruans themselves. The agreement was drafted as the League of Nations, after the First World War, had the unenviable task of balancing emerging principles of international institutionalism, with old imperialist desires concerning victory and spoils. Then-prime minister Billy Hughes fought doggedly for a share of the latter, with his eyes squarely on Nauru. From 1888 to 1914, Nauru had been a German protectorate, a strategic Pacific outpost of Bismarck’s Reich, although it was the British Phosphate Company that “discovered” and promptly set about strip-mining the high-purity marine phosphate. From the execution of the agreement through to Nauruan independence, Australia oversaw the strip-mining of over 80 per cent of Nauruan land, paying a relative pittance in royalties back to Nauruan landowners. In 1968, in the context of the international shift toward self-determination of colonial territories, Nauru became an independent republic in 1968. The new state inherited a European constitution still in force today, and a minimal infrastructure designed for the singular purpose of exporting phosphate. Taking the long view, Australia’s use of Nauru for offshore processing is best characterised as part of a long history of colonial exploitation, and not as an opportunistic use of a poor Pacific neighbour. The latter attitude is tacitly encouraged by references to Nauru as a “failed state” , a “lost paradise”, or a “moral fable” of corruption, indolence and greed. Labeling Nauru a “failed state” neatly erases and excuses the damage wrought by colonialism for much the same reason as Australia’s Indigenous population are called “dysfunctional”; it disregards the extraordinary strength and ingenuity of many members of indigenous communities, and disowns the circumstances that prevent them from achieving the “success” of mainstream Australia. Continuing to label Nauru as “failed” or “lost” allows the responses of Nauruan people to Australia's continued exploitation of their island – this time as a theatre for playing out the “Pacific Solution” through the Regional Processing Centre (RPC) — to be assumed, disregarded, or at best glossed over. Even the ABC's recent Four Corners program “No Advantage” — commended for its incisiveness — managed to incorrectly name a Nauruan MP it interviewed in the course of providing a glimpse into the “reality” of offshore detention (there is only one MP called Dominic Tabuna – the then Deputy Speaker; the other MP labeled as such was Mathew Batsiua, then Foreign Minister and key spokesman for the Nauruan government on the RPC). It is therefore worthwhile noting the variety of Nauruan responses to the re-opening of the RPC which, in comparison to the level of Australian popular debate, are remarkably sophisticated and well-informed. This is especially so given that the two official sources of information (namely the state broadcasting agency, Nauru Media, which has recently test run its first website, and the Government Information Office) are poorly funded and struggle with an unreliable power supply, internet service and understaffing. I discovered, through a short period of time spent working with a local team for the Parliament of Nauru on the 2009 referendum campaign, that news on Nauru circulates incredibly well. News, rumours and anecdotes flow — and political positions tend to develop — along more informal, private lines of communication. Partly, the reasons for this are cultural; familial affiliations run deep, as is understandable in a small community of 10,000 occupying an area of 21 square kilometres, represented by 19 members of parliament (who often concurrently hold familial positions of authority). As a Nauruan friend once commented, “people think really hard before criticising another Nauruan; each one of us is a pyramid covering half the island”. And partly, the reasons for the seeming informality of political engagement are circumstantial. Many Nauruans now live off island; some still maintain wealth enough to fly in and out with relative frequency; and others have never left. As such, many Nauruans engage with and debate the issue of the RPC via personal communications across the diaspora: Facebook pages such as “Nauru Politics”, blogs like Dexter Brechtefeld's on Nauruan politics and Twitter accounts like that of photographer and recent electoral candidate, Clint Deidenang. Most Nauruans acknowledge the difficulty that Nauru's financial and political situation has posed in constructing a principled policy response to the RPC. Politically, Nauru has endured years of constitutional crisis and deadlock, a chronic instability that did not seem to hinder the Gillard Government’s keenness to reopen the RPC, despite the near impossibility of the Nauruan parliament formulating and enforcing a clear policy. Financially, Nauru has been in dire straits since the early 2000s, when primary phosphate reserves were finally exhausted after years of falling international prices. Financial mismanagement of the Nauru Phosphate Royalties Trust, some of it criminal and much of it at the hands of Australian legal advisors, left Nauru flat broke. This poverty severely undermines its decision making capacity. For example, it is rumoured on Nauru that the Government — an ever-shifting landscape of contingent allegiances — was paid by Australia to ratify the Refugee Convention, a move the republic had previously avoided not out of any moral recalcitrance but because of the costs involved in complying with international instruments. From an Australian perspective this may seem churlish, but the cost of satisfying the reporting requirements of the multiplicity of international agreements is a heavy financial burden on a tiny state that has owed many of its public servants back pay for almost a decade, and can barely afford to run enough parliamentary sitting days to deal with its own parliamentary business, let alone that required by international compliance regimes. In this context, the irony of Nauru having passed legislation to deal with refugeeism while the island itself is facing uncertainty over its future habitability is rather galling. Yet Nauru is not summarised by this poverty, and is no simple mendicant for Australian aid. Indeed, Nauruan landowners demanded a say in the conditions that were to apply to the reopening and redevelopment of the RPC. There is now serious political disquiet in Nauru over whether Australia is honoring those conditions, particularly those relating to rates and conditions of local employment. An unverified Transfield document from late 2012 puts rates of pay for Nauruan staff at the RPC between $4 and $7, figures confirmed by local sources; and the promised provision of training for prospective Nauruan staff has not materialised. Recently elected Prime Minister Baron Waqa has already made clear that under his administration, the conditions of the agreement between the republic and Australia are back on the table. Overall, however, Nauruans seem intensely aware of the humanitarian crisis that Australia has exacerbated by forcing asylum seekers into offshore detention. It is they, after all, who are dealing with the presence of a makeshift prison housing approximately 450 asylum seekers; strangers whom, Nauruans are well aware, now have a dim view of their beloved island. The circumspection and compassion with which many Nauruans continue to approach the issue is impressive, particularly given that the position in which Australia has placed Nauru neither assists the island in its quest for political stability, nor clearly provides a financial benefit. Nauruan attitudes to the RPC should not be assumed as either predictably opportunistic, or peripheral to the issue of Australia’s policy of offshore detention. 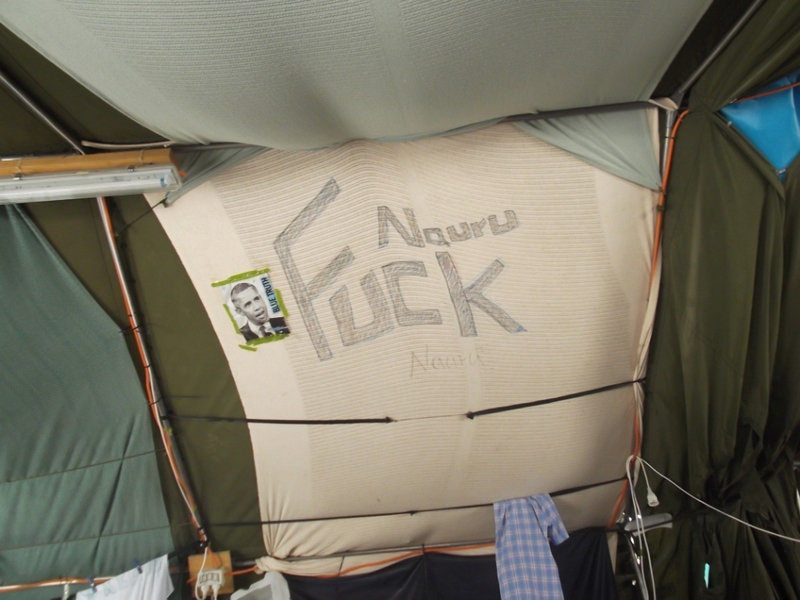 Despite the government’s recent conduct towards the island, Nauru is not an Australian colony, and unlike Australia, seems to know itself very well.